Welcome to the Rangeley Family Tree website. We have been tracing our family history for many years. 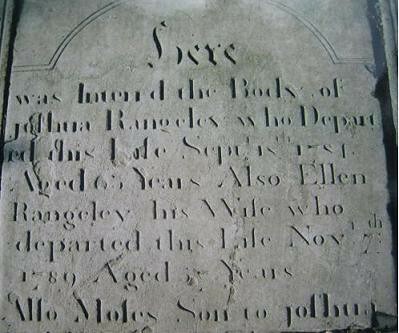 It all began after coming across the gravestone of Joshua Rangeley outside the church in Hayfield, Derbyshire, and we wondered if we were related. Indeed, we quickly discovered that our family tree does trace back to Joshua. Though unfortunately, his christening has remained elusive and we are unable, as yet, to follow his line back any further. We suspect he must have originally come over the Pennines from Yorkshire as there appear to be no other Rangeleys on the western side of the Pennines before him. Moreover, Yorkshire contained, and may still contain, a greater concentration of Rangeleys than any other county in England. Joshua's descendants seem to have spread across North Derbyshire into Lancashire and Cheshire, for the most part, but also elsewhere in the UK, and some went to the USA, Canada and Australia. You may be aware of another Rangeley family tree, which has been extensively researched and can be readily found online. This family appears to originate in Yorkshire, and one notable individual, Squire James Rangeley, emigrated to the States and established the town of Rangeley, Maine. Despite much effort, no link has been found to connect these two distinct family trees and we have not included the Squire James tree in this database. Since the surname Rangeley is a relatively rare name, it is tantalizing to think there must be a link somewhere. Unsurprisingly, during the course of research a lot of names and branches have been added, and are continuing to be added, to our family tree. We wanted to include as much of this information as possible in our website in the hope that it would prove useful and interesting to anyone researching their own family history. Below, you should see a picture of the very gravestone that started our research.